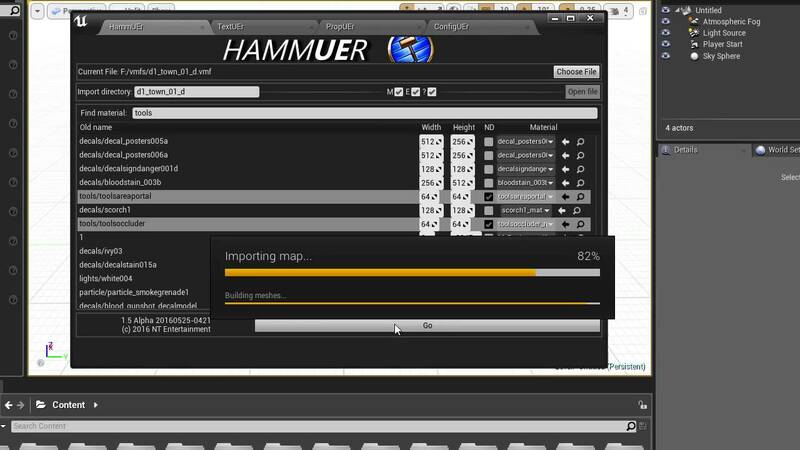 HammUEr is a (currently Windows only) plugin that lets you build your levels with Valve's Hammer Source map editor (VMF), Doom3's DoomEdit (MAP/PROC) or a Quake-based map editor like Radiant, Jackhammer or Trenchbroom (MAP). With just a few simple clicks, you can have them imported into your Unreal Engine project as a collection of meshes placed in your scene the way you want, where you want. Want to change something? Make your edits in your favourite tool, then save, re-import, and you're done. 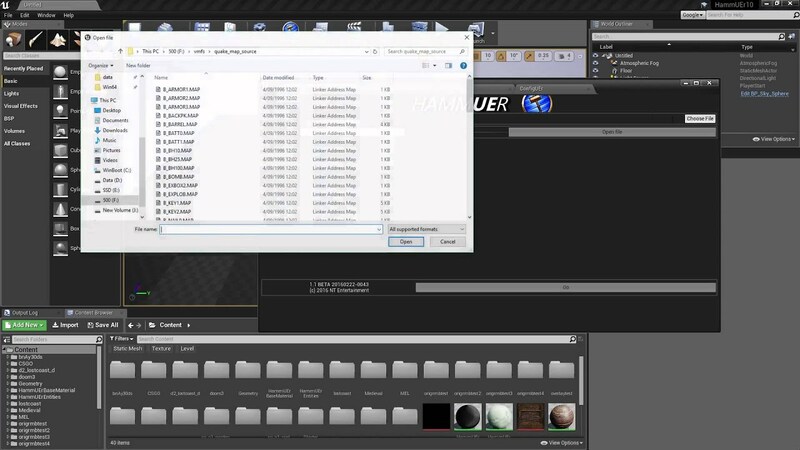 During the importing process you can assign materials already in your project to the original material names, or if you have the source images - (TGA/BMP/PNG/JPG)/VTF&VMT/MTR(D3)/SHADER(Q3)/WAD(Quake1 & Halflife)/WAL(Quake 2) - you can import them into UE as material instances based on a template material of your choice, and let HammUEr automatically find and assign the right ones. Don't want certain materials to show? Mark them no-draw and HammUEr will automatically not build polygons for them! Go to itch.io or Gumroad. But what about the Marketplace? Epic has decided not to carry the plugin for various reasons beyond my control. Still confused? Maybe these tutorial videos will help. Follow @hammUEr for the latest news. With thanks to @JoeWintergreen for the video and screenshots. 1. Are collisions maintained during the export process between hammer and UE4 or do I have to set the back up in Unreal 4 or 3D Modeling app? 2. Can I export from the awesome TrenchBroom Editor to Unreal 4? Are additional formats supported beside .VMF? 1. Currently, it sets the meshes to use complex as simple (so per poly) collisions when importing them, which should be fine for most of the simple brushes. 2. Not at the moment, but other map formats could get added in the future. I might take a look at what trenchbroom produces soon-ish. AMAZING! I need this right now! Great job!! and then it would comfortably import into UE4 via HammUEr. Coming from Source to UE4 this is great but one Q hammers units are inches and UE4 is cm does this plugin compensate for that or must you scale the imported ue4 file by 2.4 ? this appears to be a rather excellent rendering time saver. i might be interested in learning. thanks for the trailer. very intriguing. .rmf, yes, but Source Hammer chokes on most Quake .maps. There's a setting for that! 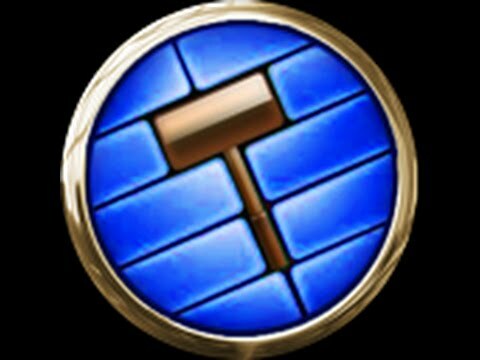 "Scale conversion" is number of Hammer units to one meter in Unreal (I think. Turfster might correct me). As far as I know the scaling would be 2.54, not 2.4. For those who don't know yet, ProBuilder is a tool for Unity that lets you create and edit meshes (brushes) in a similar fashion to Hammer and a UE4 version is already in works. It would be a whole lot easier to do any sort of edits within UE and export the VMF than to edit in Hammer and reimport for any minor tweaks. Having a way to export the imported VMF back to VMF would be fantastic for this use.